• Doesn't appear to be a women's wallet, so best for men only. • Would not fit in smaller pockets. Wonder Wallet mostly delivers on its promise to store a larger number of cards in a flatter space. Availability is currently limited to the official website, and consumers are forced to purchase two wallets and pay shipping. Those issues aside, Wonder Wallet does a pretty good job of living up to the advertising hype. Wonder Wallet is an As Seen on TV wallet which claims to hold twice as much as a standard wallet, while taking up half as much space. You can purchase Wonder Wallet from the official website for $19.95 plus $5.95 shipping. A second wallet is included for an additional $5.95 shipping, bringing your total to $31.85. You can’t opt out of the second wallet. We noticed if you stay on the website long enough, a $5 off window will appear, which would reduce your order down to $26.85. Wonder Wallet is now available in stores for about $20. You can find it in the As Seen on TV section of retailers such as Walmart or Target. As Seen on TV wallets and organizers have been a mainstay of late night television for decades. Bulky wallets have always been a problem, dating back to the invention of the wallet itself. With Wonder Wallet, we are told that the days of sitting on a bumpy, bulky wallet are over. While such a prospect is enticing, we first wanted to know how they would manage to fit everything into a smaller space than a standard wallet. We were surprised to find that Wonder Wallet did manage to hold a respectable number of items in a flatter space than expected. 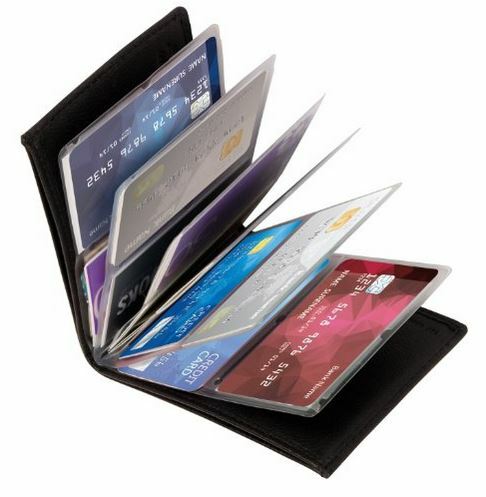 This is achieved by two-pocket card holders, as opposed to standard card holders. These card sleeves place cards side by side, which allows you to hold a larger number of cards in a smaller space. Some reviewers have asked if the wallet actually holds cash – which it does – although the advertising barely highlights this fact. When filled with 24 cards and some cash, Wonder Wallet will measure about an inch thick, and it bends in the middle, allowing additional contouring when seated. Wonder Wallet includes RFID blocking, which is a current buzzword when it comes to products that hold credit cards. In just the past month, we have evaluated Lock Wallet and Card Lock, both of which highlight the ability to prevent credit card skimmers from stealing vital data. Although the risk of theft via RFID technology is largely overstated, many consumers seem to want this feature, thus it is a wise addition to the product. If we were to find fault with the product, it could be stated that, although it is marketed to both genders, Wonder Wallet has the look of a man’s leather wallet, which some women may not find aesthetically pleasing. The other potential drawback is that its size of 5.25″ x 4″ may not fit well in smaller pockets. While Wonder Wallet saves space in thickness, it increases size, which makes it a rather large accessory that may not fit comfortably in all types of pockets. You may also have an option to “upgrade” to better wallet, which we did not do. If you purchased the upgraded wallet, please let us know your thoughts. The TV ad below has been running as of this writing. Are you tired of bulky wallets crowding your purse? Is that wallet bump under your rump hurting your back? Sick of searching for ID, cards. and cash? Introducing Wonder Wallet, the amazingly flat wallet that’s twice as thin as a regular wallet, but holds twice as much. Incredible! Go from bulky and fat to slim and compact. From so stuffed, you could bend her, to flat and slender. Crafted with genuine leather, wonder wallet features twelve clear sleeves to hold up to 24 cards. ID, gift, credit cards, insurance, and more, plus cash. Organized and super slim. The secret is Wonder Wallet’s patented design. It’s laid out like a photo album, so it holds twice as many cards on each side. See everything at a glance. This wallet’s overstuffed, but everything fits perfectly in Wonder Wallet! And why carry this big ol’ wallet when Wonder Wallet is so thin, it all fits right in. Soft supple leather flexes, so it’s comfortable to sit on, even in the car! RFID blocking stops remote scanning of cards and protects private information. Ordinary wallets can cost over $100, but, get Wonder Wallet now, crafted with genuine leather, for just $19.95! Available in black, tan, or red. Order right now, and we’ll double the offer, and send a second Wonder Wallet in the same color – free! Just pay separate processing and handling. That’s two Wonder Wallets, an over $80 value for just $19.95! This special TV offer is not available in stores. Call or click to order Wonder Wallet now! Wonder Wallet is an As Seen on TV wallet which delivers on its promise to store a large number of cards in a flatter space than standard wallets. Wonder Wallet does a pretty good job of living up to the advertising hype, although you may want to purchase locally to inspect its size and design. If you’ve used Wonder Wallet, please give it a star rating and comment below. This review has been updated since its original publication in July 2015. ROYI Stair Climbing Cart Review: Does it Work? I’ve seen this commercial a number of times on the channel I’m watching and have to laugh. Who carries all of those cards in a wallet? Why would you? The funnies was as they were flipping thru the wallet, a Social Security card was seen….who puts that in their wallet??? I think people need to re-think what they put in their wallets. If you have a number of gift cards, keep them at home until you’re going out to the store. You also don’t need phone cards in their either. Nothing more than a scam. Horrible company. I was checking out their product online when my screen went blank. Discovered they had charged me for something I didn’t order. When I finally spoke with them on the phone they told me that I couldn’t cancel the order until my bank payed them and the order was shipped! I bought mine at Walmart and works great. I carry a lot of cards also. I do. I own two businesses each of which have a debit card and credit card. Same for personal. Also fuel cards for the businesses. Not to mention club memberships, medical insurance for myself and one each for my grandchildren and, of course, AAA card and license. That makes 18 or so before you even consider gift cards or store credit cards. I am glad your life is so simple and organized that you only go to a specific store directly from your home so you can take that specific card with you. I totally agree! I just replied to the comment right before I read your msg and I had said just about the same thing you did! Yup some people just live a very simple life and aren’t as involved as us. Actually I carry many cards in my wallet and wish I had space for more. I never know when I may need a card that I left at home and wish it was with me. I have to prioritize which cards I use most. i have four payment cards six credit cards and then there’s my membership cards. Also my roadside assistance card. That’s why I would carry all those cards. But true, I agree, not SSN, but four insurance cards which are requested sometimes unexpectedly. I like this idea, if it works. I too carry many cards and need the RFID blocking. I have a driver’s license, debit card, Costco, Dental card, insurance card, store cards, and I was able to get several card shaped RFID blocking, but my cards are double packet and I am still getting different cards. But I would like to have a secure strap with velcro closing to keep the wallet closed. they are charging $7.95 p&h for second one plus another $2.00 ???? well it does carry 24 cards, and it is thin. If you want Big but thin, then the wonder wallet is for you. Big as crap. what it makes up in thinness it loses in size. this is like carrying a damned book in my back pocket! I was using the ID stronghold which is rated as the best wallet in the market. and I carry the same stuff in this wallet with the equivalent width. and its also twice as small. Its also zippered to keep my money and cards INSIDE the wallet. fits easily in any pocket and with everything not any thicker than the wonder wallet. (Bigger than any wallet Ive ever owned). hmmmmm. Mighty Wonder wallet! BIG!! Sleeves will not accept many laminated products due to width of pocket. Simple solution would be to increase the width of one of the 2 pockets by just a little and this would make the wallet more functional. Customer Service made no effort to help get me to someone to comment personally to this issue. I received a refund, but only about half of what I spent, or I could have returned the 2 wallets for the same amount of money lost. I guess Christmas is coming early for some Family members. The product needs further R&D to fix this problem, and it would be very easy to accomplish. As of now, I cannot recommend this wallet to my Friends and Family. Seems like a good enough idea. I made this purchase with great hopes, but to my chagrins, the plastic card holder broke after only a few months (like 1 month beyond the warranty) and was no longer able to be held in the wallet. Cards were difficult to pull out. Overall, bad purchase. This was the worst purchase. The wallet fell apart after 2 weeks. I had difficulty getting the cards out of the sleeve and then it fell apart while I was in line in the store. Never was I so embarrassed. Do not purchase a Wonder Wallet. I love the wallet but t doesnt last!! The clear piece that goes in the wallet to hold all the cards is cheap and breaks off. Now you have the cards all in a holder and no protection. I tried calling and they have you on hold forever and never answer, . I went through both of them in 2 months. And it DOES look like a mans wallet. Everyone tells me that when I pull it out of my purse. And now they wont let me post!!! It is far thinner than a regular wallet while carrying more cards. Nice large area for cash. Conceptually a nice solution. I was very excited to receive my wallet. I loaded it up and found the design to make a difference – first that I could easily find and visually check what I had in my wallet. It is thinner. So far so good! TWO CARDS per slot. Okay great except they are VERY difficult to remove, further the plastic slot begins to separate at the seams if you remove and replace cards frequently. ONE CARD per slot. So where two cards make it difficult to remove cards putting one card has the opposite effect CARDS EASILY SLIDE OUT of the slots, and with a top feed design I have LOST two cards already, and very nearly lost more as I noticed the cards sliding out as I removed the wallet from various pockets. I want to use this wallet but WILL NOT until they fix the holder problem AND HERE’S HOW, simply load cards from the middle of the card holder NOT the top. I was very exited about the Wonder Wallet also. I liked the idea of being able to see what I have in my wallet. I also agree that they must fix the design flaw. Top loading the cards is not a great idea. With use they get flabby and the cards fall out. Maybe the wallet should be made to have the inside facing each other design. I like the wallet and if they came out with a new safer design i would buy it. Holds a lot of cards in smaller space. Won't stay closed. Needs a snap to keep the ends closed. Disappointed with this wallet. It won’t stay closed and is not at all suitable from a woman’s perspective. Sending mine back to Publisher’s Clearing house. Holds multiple cards in a slim format. Protects cards from rfid readers. Real leather wallet. The flaps that hold card holder into wallet became brittle and broke within 30 days of purchase. Renders it useless. I have had other wallets with more durable inserts. The leather wallet is useless with the use of cheap materials for the insert. Don’t buy!!! Vinyl insides that hold cards falls apart too quickly and it seems they don't sell the replacement insides separately. Bought one for my husband for Christmas. Insides started splitting and falling apart in less than two months. Not worth the money if it doesn’t even last a year. Good value paid 17.95 with tax and shipping included from Publishers Clearing House. This product advertises that it can hold everything that is seen in those bulging wallets that held up by the ladies in the advertisement. The only thing this “wonder wallet” can hold are a bunch of credit card size cards and money (Bills only). Where do you put all the lists and notes and the other “stuff” bulging out of the wallets? Simple “false advertising” as far as I can see! 2) They separate at the bottom….so that cards can be pushed straight through. 3) The entire insert now is torn at the point of where it fits into the wallet…meaning at any point, the entire insert will fall out. I’ve only had the wallet 4 months and sadly cannot find my receipt because I would certainly return it! Typical China JUNK! I bought 3 of these and all 3 started falling apart in less than 2 month. I purchased mine for $25. in Canada. I don’t find it too big for my purse. I have more than 24 cards so it’s quite useful. I found that the cards were difficult to take out so I cut the plastic to bhe able to hold the card to pull out. I didn’t do a very good job as I have lost 2 credit cards that slipped out without my knowledge! Now I would like to purchase the plastic to put the cards as the wallet is in very good condition!